The Dakota Access Pipeline should’ve happened 10 years ago. The reasons it didn’t are as American as fracking and apple pie. Demonstrators protest the Dakota Access Pipeline in front of the White House in Washington on Sept. 13. 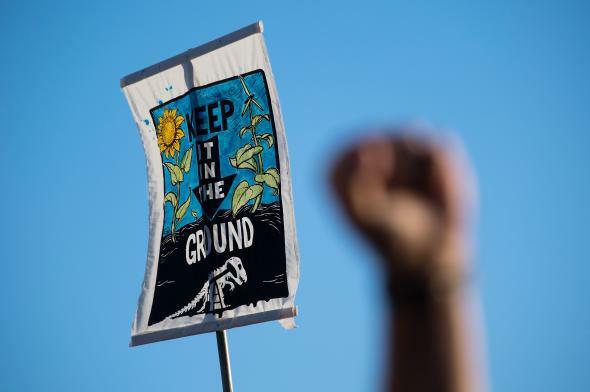 The showdown in North Dakota between the Standing Rock Sioux Tribe and the company Energy Transfer Partners, which is trying to build a 1,172-mile oil pipeline to Patoka, Illinois, has become both a cause célèbre and a celebrity cause. Democracy Now journalist Amy Goodman was arrested there in September, and actress Shailene Woodley was arrested earlier this month. The episode (here’s a good explainer) is compelling in part because it is the latest flare-up in a 500-year conflict between European settlers and Native Americans over the control and use of land. The tribe argues that the pipeline’s path will run through burial ground, and some progressive and environmental groups have also latched on to the cause. North Dakota was not a center of oil production until recently. In fact, the state was seen to be in terminal decline. In 1987, two sociologists proposed that a big chunk of the state could effectively return to the state of nature, a Buffalo Commons. But the advent of a new technology—fracking—led to the discovery of a vast new oil resource in the Bakken Shale in the western part of the country. Companies large and small rushed in to drill for oil. So production boomed, from about 90,000 barrels of oil per day in 2004 to about 500,000 barrels per day in 2011 to about 1.2 million barrels per day last year. That’s an increase of more than 13-fold in 11 years. Amid the boom, drillers rushed to get the stuff out of the ground. But the infrastructure to transport oil and its byproducts to the market hadn’t been developed. As a result, the boom had a lot of negative impacts on the environment. Natural gas is a byproduct of drilling for oil. In long-established centers of production, companies build the equipment and infrastructure to capture and ultimately use that gas. In North Dakota, where natural gas processing and storage infrastructure lagged behind oil production, companies simply did what wildcatters used to do: They flared it off. As this chart shows, in 2008 and 2015, anywhere from 25 to 35 percent of the natural gas produced in North Dakota was simply burned. (The proportion has since fallen to about 10 percent.) Flaring natural gas, of course, releases carbon dioxide and other greenhouses gases into the atmosphere. Pipelines are generally the preferred method for moving large quantities of oil over long distances, and they are generally quite safe. But the Bakken’s production far outpaced the region’s pipeline capacity. The companies that drilled for oil weren’t spending their resources to build and operate pipelines: Doing so takes a lot of capital and, more significantly, a lot of planning. You have to get permission from a patchwork of landowners, stakeholders, and regulators—private individuals, states, the federal government, and Native American tribes. So they reverted to the 19th-century method of putting crude oil on trains. Between 2010 and 2015, the volume of crude shipped by rail in the U.S. rose 13-fold, and sometimes with dangerous and deadly results. In the 2013 Lac-Mégantic tragedy, a 72-car train filled with Bakken crude exploded in a small town in Quebec, killing 47 people. An explosion last summer in Oregon was the latest in a long string of accidents involving trains carrying oil from North Dakota and Canada. The disconnect between production inspired by individual actors and infrastructure that needs collective action to be approved and built is nothing new. In the late 18th and early 19th centuries, settlers streamed across the Appalachian Mountains to farm the fertile Ohio River Valley, long before financiers and government officials arranged for the construction of roads and canals that would carry the grain efficiently and economically to New York City and other markets. In the late 1850s and 1860s, oil pioneers started drilling and producing oil in rural Pennsylvania before railroads and pipelines had been built. More recently, entrepreneurs and companies have rushed to build huge wind farms in Texas and the Plains—often far in advance of the construction of transmission lines to carry that power to market. The reality is that mapping out a big interstate infrastructure project takes a degree of planning and coordination between governments and multiple states that isn’t necessary when you’re just, say, drilling for oil or setting up wind turbines but becomes a requirement once those activities reach a critical mass. The challenge is aggravated by the sheer scale of America, as well as by the fact that the federal government doesn’t simply control and manage economic development issues as they come up. Add it all up, and standoffs like the one we’re seeing in North Dakota are inevitable. The time to build and plan a pipeline to carry Bakken oil was 10 years ago. And the construction of the pipeline then might have helped avert much of the damage wrought by the burning off of gas and especially the oil train disaster. But North Dakota alone lacked the capacity or interest to lay pipe all the way to Illinois. Oil drillers each have a keen incentive to see a pipeline come into existence but don’t have much incentive or ability to act collectively. The federal government, for all the Western complaints about Washington’s tyranny, treads lightly. So infrastructure, once again, rolls out in a herky-jerky, nonoptimal fashion. In American business, history always rhymes.